Thanks to everyone who believes in us and thanks to all the great artists who believe in themselves and make the most beautiful arts! Posted in GeneralTagged Amsterdam art galleries, Dutch street art awards, street art, street art gallery amsterdam Leave a Comment on We won it!! ‘Winter Blues’ at GO Gallery, opening 16 January. 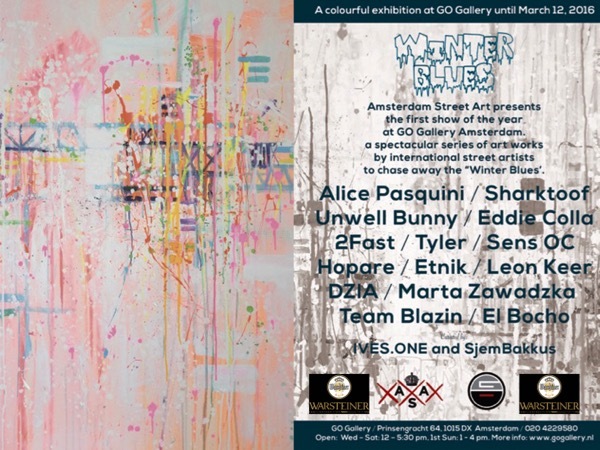 Posted in GeneralTagged 2FAST, alice pasquini, ASA, dzia, Eddie Colla, El Bocho, etnik, leon keer, marta zawadzka, sens oc, sharktoof, street art, team blazin, tyler, unwell bunny Leave a Comment on ‘Winter Blues’ at GO Gallery, opening 16 January.